My daughter and I are going out to breakfast and I'm having my very favorite meal. Later in the day Sweetheart is fixing dinner and I've prepared a simple dessert. Go Here. I picked more of my pink roses and put them into my new vintage vases I found at the thrift store. I love old vintage vases with bouquets of roses. My Gorham Secret Garden Beautiful Cream and Gold Trimmed vase was a real find. 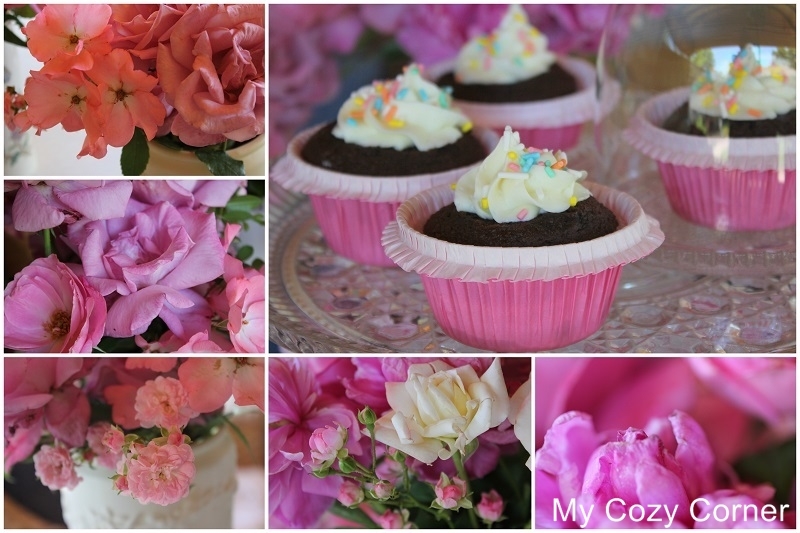 A cupcake in a cloche is so delicate for a Mother's Day gift. I'm enjoying my pink roses, but soon they will be gone. The wind and heat have already shorten the blooming season by two weeks this year. Yummy! Rich, Triple Chocolate Fudge cupcakes with vanilla frosting a touch of decor. Peonies, Fairy rose, Secret, Garden Party, Tiffany, Simplicity, Therese Bugnet and Gene Boerner are some of the roses in these vases. We're on the same wavelength about the cupcakes!!! Wishing you a Happy Mother's Day! I love these cupcakes, they're so adorable! Beautiful vase and vignette you created for Mother's Day and here for you to have a lovely day! What a lovely pink way to honor this special day. Enjoy each other. I lost my mother very young. What a delightful post! Yum! Your cake plate full of cupcakes are darling. I'm really liking those pink paper liners!!! Peonies are my favorite flower and they look wonderful in the vintage containers.